The holidays are here again! Even though it’s 90 degrees outside (we’re in Los Angeles), we’re starting to see turkeys and reindeers cropping up everywhere. 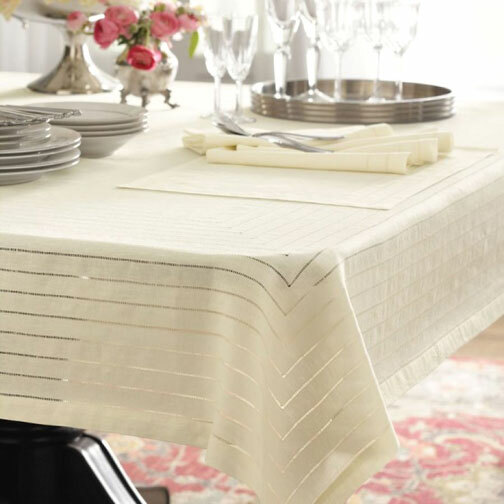 Tip 1: Select a tablecloth that is about 8 to 12 inches larger than your table on each side. To keep it simple, just add 20 inches to the each dimension of your table (width, length, or diameter). For example, if you have a 48″ by 68″ table, get a tablecloth that is approximately 68″ wide x 88″ long. This will give you a practical drop (enough to be formal, but not too much to leave a lot of fabric on your guests’ laps) for either casual or formal occasions. Generally, drops that are shorter than 6″ will look skimpy. If they’re a bit longer, that’s fine — your table will look more formal that way. If you don’t want to do the math, here’s a chart of recommended tablecloths for common table sizes. Tip 2: White is classic, ivory is softer, and holiday colors are festive and dramatic. What’s the right color for your tablecloth? It depends on your mood. White is formal and always appropriate. Many people also prefer ivory, beige, and ecru tones for a softer look, especially paired with English china. Special holiday colors such as brown, gold, and red can be very dramatic. If you’re getting your first tablecloth, though, go with white: it’s a great basic and you will never go wrong. Tip 3: Linen is the most formal, cotton is always appropriate, and synthetic blends are great if you’re short on time. Linen or cotton? For some people, nothing says “formal occasion” like a linen tablecloth and crisply ironed linen napkins. That’s why our Chrysanthemum Irish linen damask tablecloths and Tudor hemstitched Italian linen tablecloths are always a good choice for the holidays. Nowadays, however, cotton tablecloths are just as acceptable. They’re used in the finest restaurants around the world, and the choice of colors available is great. 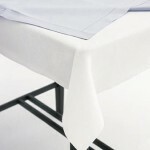 Our Carlton cotton tablecloths give you the heavyweight feel of fine restaurant dining. What about synthetic blends? We have some great choices available that feel as soft as pure cotton, but require almost no ironing. They’re terrific if you’re short on time. Tip 4: Get a shape that matches your table. If you have a rectangular table (even if it has slightly rounded corners), then it’s easy: get a rectangular tablecloth. Some manufacturers also use the term “oblong;” it means the same thing. If you have a round table, then you can get a round or square tablecloth. Finally, if you have a round table with leaves, then you can use either an oval tablecloth (the drop will be more even throughout) or a rectangular tablecloth (the corners will drop down more than the rest). Both look great. Tip 5: How do I wash my tablecloths? Relax! You’ve probably washed cotton and linen products your whole life, and tablecloths and napkins made from those materials are no different. Just treat stains early (avoid bleach if possible, as it will weaken the fibers over time), launder them in cold water, and follow our general tips for caring for your linens. We’ve also had a lot of success with the LeBlanc Linen Wash ourselves, by the way, so you might want to stock up for the holidays. OK, that’s all you really need to know about tablecloths. Now go and enjoy your holiday season! 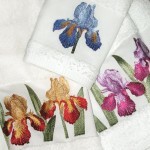 Gracious Style is an online retailer of sophisticated, high-quality products for every room in the house. We love helping others create warm and welcoming rooms for themselves. To read more, visit our blog.